Keep an eye out for red grouse, skylarks and peregrine falcons as you scale Black Mountain for unbeatable views across the Belfast skyline. A steep walk through thriving heathland to the summit of Divis Mountain. On a clear day you can see the Scottish, Cumbrian and Welsh uplands rising from the horizon. Resting on the doorstep of Belfast, Divis and the Black Mountain holds a special place in many people’s hearts, from childhood memories playing on the slopes, to inspiring songs, fantastic photography and acting as an inspirational backdrop for sporting events. Divis and the Black Mountain really is an awesome place. Local man Don Morris was inspired so much that he even wrote a song about it, appropriately named My Black Mountain. 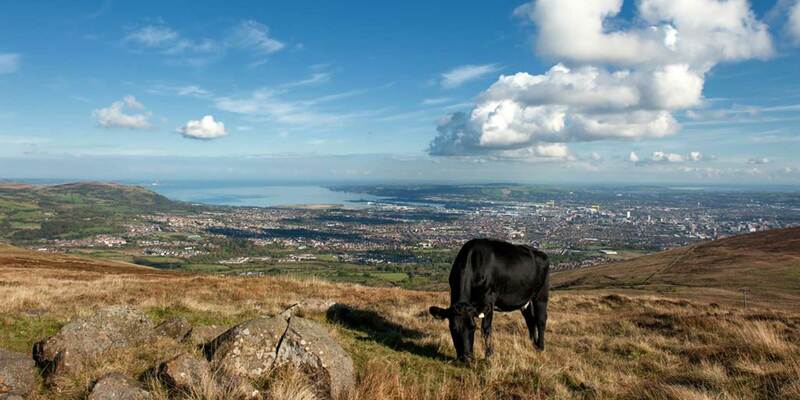 The mountains rest in the heart of the Belfast Hills, which provide the backdrop to the city’s skyline. The rich, varied archaeological landscape is home to a host of wildlife. There are walking trails along a variety of terrain: through heath, on stone tracks, along boardwalks and road surface.